Kelvin followed his older brother Glyn into the Morris, joining the Side in 2000 under the guidance of the late Nick Tyndall. 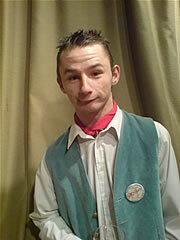 He won the Michael McArdle Young Dancer of the Year Award in 2004 and is still one of our best dancers. As well as being the only remaining lad of many that Nick brought into the side, Kelvin wears Nick's bells and flowers as a mark of remembrance.